Every now and then I look into my makeup collection to find out which products I haven't been using and if it's time to say good riddance to that much loved limited edition product. I used to be quite a hoarder but these days I tend to be quite ruthless and know when it's time to have a clear out. 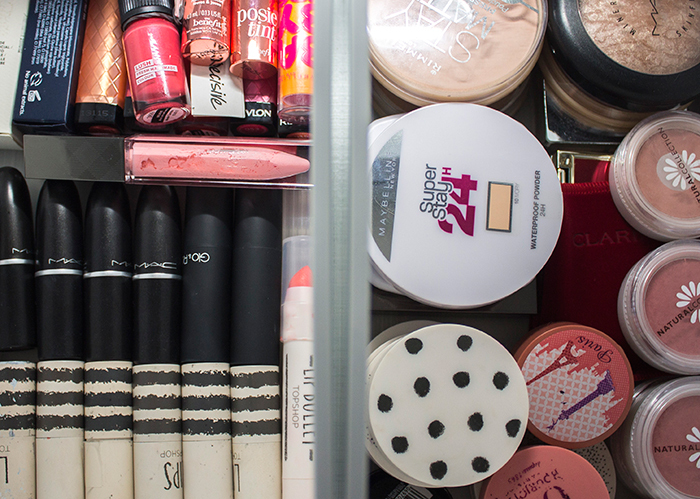 Here's some tips on how to Spring clean your makeup collection. Start off with products which have smaller use by dates such as mascaras as those are the ones you'll know you need to part with. I try to keep my mascaras for around 4 months max but usually they won't last as long as that anyway. I also tend to use the sample size mascaras instead of full size as I'll use them up before they expire. The way I remember is that most liquids usually last for 1 year and powder products usually 2 or 3 years. Once you've got rid of the expired products, look at your products in categories like lipsticks, eyeshadows etc. If you break it down into sections, you can concentrate on which items you use most in that category and it will be clear which products you haven't been using. Now that you've picked out products you haven't been using, sort them into piles you can give to friends and family. I usually get rid of a ton of haircare products by giving them to my mum. If you don't have anyone around you who would like those products, you can always donate them to Give and Makeup where you'll be helping women in need with charities such as Refuge and Women's Aid. After you've had a clear out, it's time to clean the products you're going to keep. To clean my makeup I use my Pro Hygiene Collection Makeup Antibacterial Spray which you can spray on any product to kill 99.9% of germs without affecting the performance of the product. We spoke about it in a little more detail in our How To Clean Your Makeup post. ӏ seriously love your blog.. Pleasant colors & theme. to know where you got this from or exactly wҺat the theme is named.